We can thank Jose Guillen for Rotary’s distinguished speaker next week. They know each other from working together in the Sonoma County Courts but, unlike Jose, Judge Chouteau’s American roots go back to the Louisiana Purchase. His descendant and namesake—Rene’ Auguste Chouteau—was the French-American founder of St. Louis, Missouri. But this week’s speaker is about as local as most of us who live in Sonoma County. He grew up in the Bay Area, received his law degree from Stanford University, worked for Sonoma County Office of Education, served as city attorney for Santa Rosa, and is an avid surfer & outdoorsman who lives in Alexander Valley and keeps in shape swimming in the Russian River. 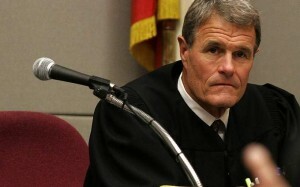 Don’t miss this great opportunity to learn about California’s Superior Court. President Peggy called today’s meeting to order and assigned Jack Abercrombie to be the designated leader of today’s Pledge of Allegiance to the Flag and asked the club’s Poet Laureate, Robbie Fouts, to lead us in the Invocation. What country’s political and religious leaders boycotted the polio vaccine in 2003 and is now the only place in the world where polio cases are increasing (in 2012, 122 cases were reported, more than twice as many as in 2011? “The Mother Club” was honored today by visiting Rotarians from four Northern California Rotary Clubs, introduced by Jane Duggan: Annette Musson, in marketing and public relations, from West Santa Rosa, Steve Amend, retired contractor from the Santa Rosa Sunrise Rotary Club, Erick Van Cleave, Website Marketing, from the Rotary Club of Glen Ellen/Kenwood, and Troy Ingold,, retail management, representing the Fortuna Sunrise Rotary Club. Past President Bill Rousseau introduced today’s main speaker, the Assistant Registrar of Voters for Sonoma County, Gloria Colter. Nicole Le welcomed her guest Joyce Coll. Ryan Thomas welcomed Daryl Reese, legal assistant with his firm, Johnston-Thomas. Jack Abercrombie introduced Kelly Pappas, whose career is in aviation. Bill Hatcher, chair of our club’s High School Recognition Committee, welcomed back Brad Coscarelli, Santa Rosa High School Principal, attending with guest student of the month Felix Herbst. Old timer Judy Glenn knows the drill from Red Badge to Blue Badge and Shannon McConnell was eager to trade her red badge for a shiny new blue one. For a small price, of course! 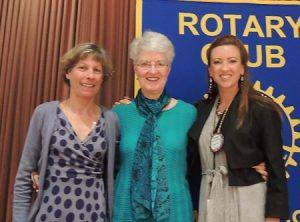 Congratulations to Judy, back in Rotary where she belongs, and to Shannon, who has found her place at our Rotary Club. The loosing cards left in the deck were down to only thirty, $665 in the Rotary Jackpot and two winning Jokers lurking in the velvet bag. Things really looked good for our side until once again Jane Duggan ran across the 7 of spades and was forced to settle for another $10 consolation prize. 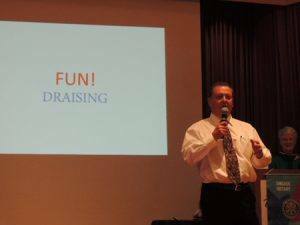 The word is actually “Fund Raising” but Doug didn’t think you would pay attention as he announced some of the obligations of being a Rotarian and what was in the works to generate the funds we need to operate as the type of Rotary Club we want to be. We will be hearing more about Doug’s “Draising” plans in the near future. One of the oldest on-going projects of our Rotary Club—so long ago that no one remembers when it began—is recognition of each high school’s outstanding student by Sonoma County’s largest and oldest Rotary Club. The chair of our club’s High School Recognition Committee, Bill Hatcher, introduced Santa Rosa High School principal Brad Coscarelli, who emphasized how important it is for our community to support our schools and celebrate our students, and introduced Student of the Month, Felix Herbst, a graduating senior with a story that is quite amazing. Felix moved from Germany to the United States at the end of first grade, where he knew almost no English. In his first year, he picked up the English language and has never slowed down. He spent his elementary years at Hidden Valley Elementary School, went to the Santa Rosa Accelerated Charter School for sixth grade, then to Rincon Valley Middle for 7th & 8th grad. Felix and his parents then made the choice to send him to Santa Rosa High School, where has been for all four years. An amazing student, he has been in the Choir and a touring member of the San Francisco Chanticleer Youth Choir. He has played the violin since he was seven, playing in local youth ensembles, and the Oakland Youth Orchestra, traveling last summer to Argentina. His principal praised Felix as a scholar athlete for the school, in cross country, making the varsity after four years, and traveled last week to the Huntington Beach cross-country invitations. He played all four years on the varsity tennis team and was made captain of the team just this month. Along with all this, Felix has participated in the Battle of the Bands and will try out for the school musical. An academic leader with a 4.42 GPA, he earned a perfect score on all five courses and perfect scores on the SAT & ACT. Outside of school, he volunteered for the Sonoma County Animal Shelter and has taught ballroom dancing at Nordquist Dance Studio for the last six years. Brad ended his remarks by saying that Felix has no idea what to do in college. He’s applying for the U. C. Schools, Stanford, Ivy League schools, and thinks he may study music & biomedical research. Darren Elliott announced that the new marketing committee was up and running with the light-hearted slide show presentation that focuses on the importance of communications within the club. Rotary Means Kindness is the theme of the public campaign which will be underwritten by sponsors to inform the public what Rotary means to the well-being of the entire community. We need the help of the entire club, targeting local businesses and organizations, and getting them involved in informing the community all that Rotary means to our community. Ted Wilmsen urged us to contact all non-profit organizations to urge them to consider making an application for a Rotary Grant for a worthwhile community project. Cathy Vicini is the Director for our Rotary Club’s Community Outreach. 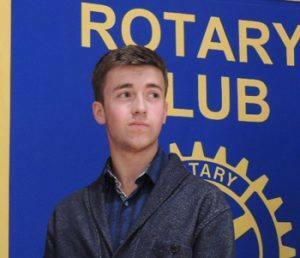 On behalf of Santa Rosa Rotary’s Youth Exchange, Craig thanked Santa Rosa High School for their support and assistance. Sponsored by the Rotary and Kiwanis Clubs of Santa Rosa, tickets are now on sale for annual Veterans Day luncheon at noon on Thursday, Nov. 7th at the Veterans Memorial auditorium. Tickets to this outstanding event are only $15 each to honor our local veterans for their service. Past President Ray Dorfman urged us to purchase tickets now for ourselves, our guests, and a few extra tickets for veterans who need extra help to attend. Our club’s goal this year is to purchase 150 tickets, Remember that the Santa Rosa Rotary Club will be dark on Wednesday, Nov. 6th, the day before the big Veterans Day recognition. The Rotary District 5130 Foundation Dinner South is only two weeks from this weekend. All Rotarians are encouraged to support the Foundation by attending this important event on Saturday evening, November 2nd, black tie optional. Until the end of October, our Rotary Club will match all contributions between $100 and $300 made to the Rotary Foundation, plus each contributor will be entered in the raffle which will take place at the Foundation dinner. The Foundation dinner is from 6 pm to 11 pm to be held at the Sally Tomatoes Event Center, 1100 Valley House Drive in Rohnert Park. For more information and directions and a map go to the Santa Rosa Rotary events calendar at www.santarosarotary.com/events. Join your fellow Rotary golfers as we compete against the other Rotary Clubs in this area. Tee-off time is next Friday afternoon, October 18th, at 12:30 pm, at the Windsor Golf Club. Past President Bill Rousseau would love for us to bring the bragging rights home to our club next week! 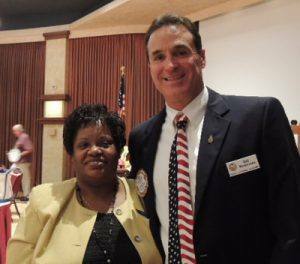 The October 23rd Rotary meeting will not be held in the Ballroom at the Flamingo Hotel. On Wednesday, Oct. 23, it will move to the alternate meeting location at St. Rose Hall, on Tenth Street, adjacent to the Catholic Church. Program chair Wayne Rowlands introduced Past President Bill Rousseau and Sonoma County’s Assistant Registrar of Voters, Gloria Colter. As of next month, Bill will have served the citizens of Sonoma County as Sonoma County Clerk, Recorder, Assessor, and Registrar of Voters for 30 years. He described the job as a complex group of duties that includes conducting elections, registration of voters, procuring election sites, recruiting poll workers, providing information to voters and candidates, educating the youth of the community who will become voters, and what appeared to be other endless responsibilities. After answering questions from the floor, Bill passed us along to Gloria Colter, who quickly brought us up to date on the many responsibilities they have to voters, candidates, monitors, and all who participate in a long list of mandates that govern and regulate the voter systems in California and the United States of America that is constantly being revised and changed. What a comprehensive education packed into what turned out to be too much information for such an important subject in too little time. Thanks to Bill and to Gloria for giving us a fleeting glimpse of a small part of voting, and the promise and expectations of things yet to come in the American democratic process.